You know what? I’ve put on weight. I think I’ve gained fifteen pounds or something over the past six months. During the Golden Week holidays, I spent one whole day changing my wardrobe, putting away winter clothes like coats, jackets and sweaters. Then I’ve found out some of my summer clothes don’t fit me anymore. It’s shocking but kind of no wonder…. I think it’s okay just to gain five pounds or six pounds. It’s no big deal. But if it goes beyond twelve- or thirteen-pound lift, it’s time to do something about it. Oh well. I think I would eat a little less and do more exercise just to begin with, which however is not so simple as it sounds. Anyhow, I desperately need to fit back into those summer clothes one way or another. All right. Let’s work on a quiz. I’ll read three sentences. Please listen carefully and choose the one that is TRUE. Ready? 1. I’ve put on five or six pounds. 2. 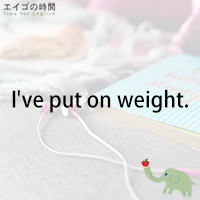 I’ve put on weight during the Golden Week holidays. 3. I need to lose a lot of weight.